I am really into giving handmade gifts, but I can not make all the things I want to give. For example, I can not paint, or draw at all. My husband had a birthday this weekend, and he really wanted a painting of our home. I am so lucky to have a very talented sister who said she would be happy to do the painting for me. The painting came out beautiful. He loves it, and so do I. I think it is the perfect present. I wanted to do something for her in return, so I asked her what she would like. She said she wanted some pillows for a window seat in her new apartment. I asked her what color, and she left it all up to me. She just wanted them to be colorful, and crazy. I have really been into turquoise and red lately. I had some perfect Alexander Henry, Amy Butler, and Moda fabrics in my stash. I did some more wavy seams, and thought it came out pretty colorful, and crazy. The back may be my favorite part. 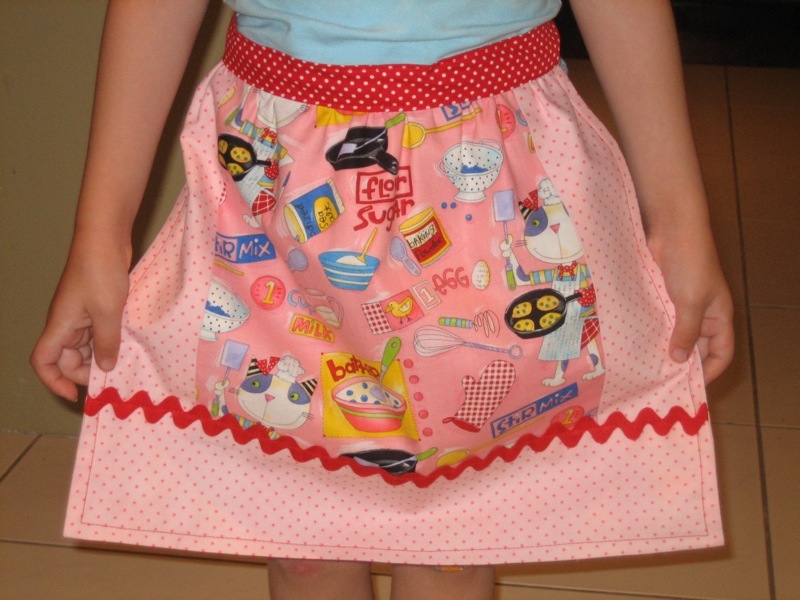 I used some more Amy Butler fabric, and a big vintage button. I wanted her to be able to take the cover off, so she could wash it, but I also wanted the back to be just as fun as the front, so she could switch it around if she wanted a change. I am off to make more pillows! Those pillows are so great - and what a great idea to trade the pillows for the picture! I couldn't agree more...hamdmade all the way. The painting is lovely and the pillows awesome...colorful, bright, FUN! Like you, I have no painting, drawing, or artistic skills in that way either. But I also have a talented sister who does! It's so great that we can all share our talents. I'm sure she equally loves the things you create too. Love the pillows. Love the painting. Your pillows are great. I love bartering too! I bartered a quilt with a blacksmith for a wrought iron headboard a few years ago. Rachel did a great job on the painting! It reminds me of her painting of your other red house, the first one. It is great that you have paintings of both of your homes, where so many good things happened to you both! I could eat the pillows you made in return-I have had a thing with gray and orange lately...red and turq are yummy too. Happy Birthday Frank!! The pillow is wonderful...as is the painting. I would say that is a good trade!! You are both lucky to have each other!! The clowns are adorable! Just precious! What a fun pillow. I love the back just as much as the front. What a fun way to share talents! You are both so talented. I love the pillow colors and style. The fabrics work great together. It makes me want to run out and buy some of the same fabrics! The picture is beautiful. I wish I could draw and paint too! Gorgeous - both of them! And a fabulous trade! Such cute pillows. That painting is beautiful! What a great trade. trading is GREAT! I love them both. What a wonderful treasure to have a painting of your home. Love the pillows. I've got to make me some pillows. They sure are festive. OMGosh! Love the picture, (perfect gift) Love the pillows. You girls are T a l a n t e d!!! The pillows are wonderful and I do love the painting. I love trading too. I have made socks for people and received some great things in exchange. What a sweet deal. They're both lovely and I want both of them, too! Yes, trading crafty goodness is the best! I adore your pillow -- great combo of colors and patterns! How great of an idea. The painting is beautiful and the pillows very styling.Not sure who got the better end of the trade, I think it's pretty even. I agree,trading is the best. I love the back of the pillow just as much, if not more, than the front too! It's really pretty. I think you both were lucky in your trade! What beautiful gifts and so much more special because it was hand done. Love the painting, your lucky to have such a talented sister to trade with! What a beautiful painting of your home! You make fabulous pillows and have great colour sense. I'll have to make some for myself now that you've gotten me inspired. And some for gifts as well! Love the painting, how sweet. Speaking of handmade gifts I wanted to make some friends the super cute rubber gloves you made a while back. Did you sew the fabric on by hand??? You both came out pretty good! The painting and the pillows are wonderful! nice house - i looks like a story book house! i love your pillows they are so bright and cheerful. Your sis is vey talented, I wish I could draw but alas all I can manage are stick people. Well, that worked out nice! And those pillows are fantastic. I am a big fan of Mr. A. Henry. the pillows are beautiful! and the picture is so exquisite! your sister is really very talented. i love the simplicity of it. what a talented family! I'm always up for a trade if you ever want to, www.AuntArt.com. I've traded with some awesome crafty ladies in the past, it's always so much fun! Great pillows - perfect fabrics. What a great idea to exchange like that. I love the painting and the pillow is gorgeous. I really love the button feature - very clever.